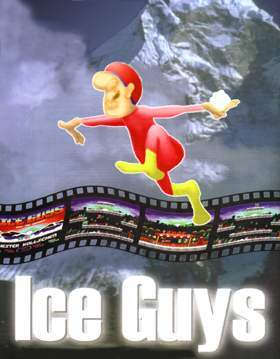 What is Ice Guys all about? 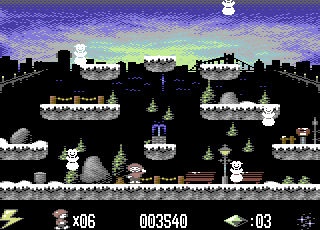 The story so far: During the last, snow-rich winter, from some unknown location lots of little, mean monsters came and decided to kidnap some snowmen! And so, lots of these beloved creatures disappeared over night from gardens, sidewalks and parks, leaving big holes in the beautiful winter landscape. Two former Antarctic researchers, which are now retired and have opened an ice café, can't accept this impertinence by any means. They work out a plan and decide to fight against the nasty little monsters, to let the snowmen return to freedom. 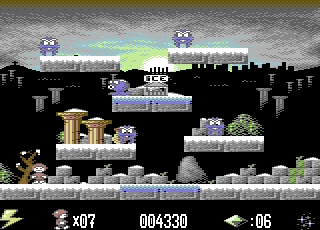 A demo version of Ice Guys is available! Spread the demo as much as you can and like. Have fun with it! 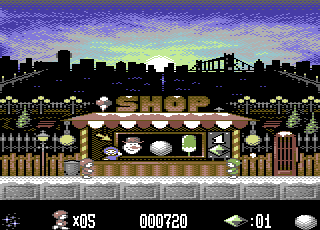 There are four worlds in total with each one having an own background graphic using the multicolor bitmap mode of your Commodore 64. Every world is divided into 8 stages. The behavior of the different kinds of monsters is very variable - some are relatively harmless, while others can really be aggressive when they feel disturbed by your attacks! So agility and fast response are required. 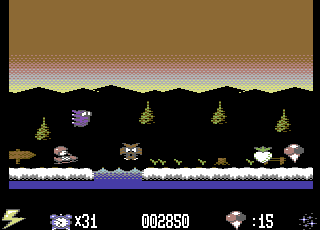 By well directed kicking the avalanches you can make additional bonus symbols appear, which can help you either at once or at the end of the level. There are more than 10 extras which you can use in many different ways. But now let's take a look at the screenshots! 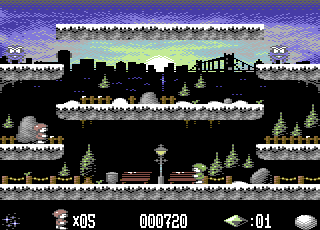 Bonus game: collect extras during the sledge race! 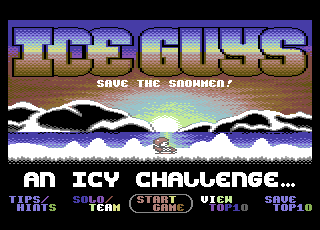 Overall Ice Guys is a game you shouldn't miss - no matter if one or two players, great atmosphere and fun are guaranteed!